This sunny new home on an East Bay hillside sings with colors that show off the crisp edges of the moulding. 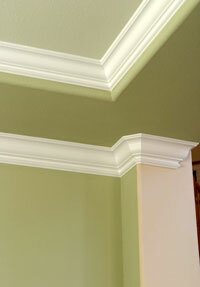 COLOR is so important for moulding! The owners chose a beautiful soft green tea color for the dinning room, a cantaloupe for the kitchen, a taupe for the great room, and wonderful Disney colors for the children's bedrooms! When you talk about moulding, it's all about color - not too bold but not too timid - and the results multiply the return on your investment. 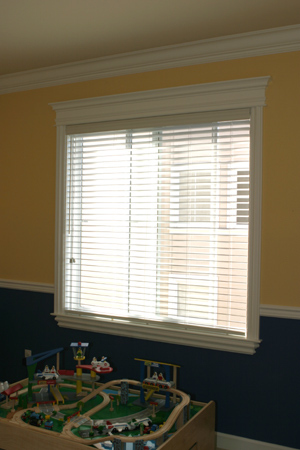 The family really enjoys their new color scheme and moulding and it was difficult to say who was more proud to show off their rooms - mom and dad with the dinning room, kitchen and great room, or the two children with their bedrooms! 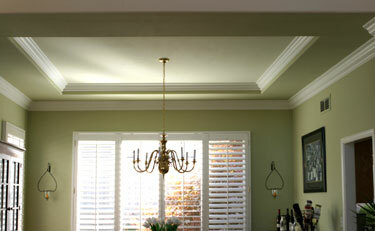 The dinning room has a recessed ceiling which the owners accented with two layers of crown moulding, creating the feeling of a coffered ceiling with a contemporary twist. This kind of decision requires expertise - and Moulding Masters is your best resource for choosing the best style and size of moulding for your project. Crown MM 139 was used on this job. Click HERE to see Crown MM 139 in our catalog. 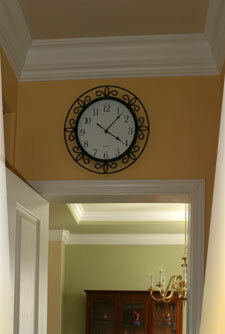 daily and special occasion times - feeling happy and proud of the beauty of your home. selling homes - improving interiors with paint and moulding makes homes both easier to sell and increases the sale price, in both new and older homes. Use your browser's back button to return to this page! The Kitchen's fresh melon color is cheerful and upbeat. 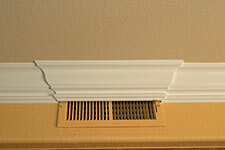 Tip: When planning to use moulding, many problem areas such as this vent at the right, become accents that add interest to the job. Many home owners come in convinced they cannot use moulding in a room because they cannot imagine how to solve a problem such as a transition area or a change in ceiling height - only to discover it's these challenges that produce the most interesting visuals in the room! This is where Moulding Masters is an added value to your investment - you benefit from our years of experience in solving these problems with beautiful solutions! At right the color of the entry hall wraps around the bull nose edge of the dinning room entry - and what was perceived as a problem becomes an enjoyable detail. 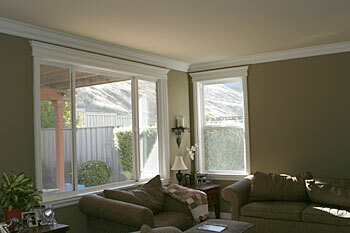 Left: Taupe walls contrast with the chunky proportions of crown and window frames. 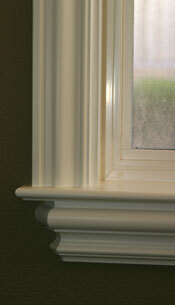 Both new homes and older homes develop a whole new character with the use of the larger sizes of moulding, creating window aprons and other finish carpenter techniques. 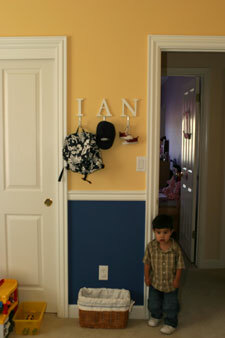 This is an excellent way to give a custom look to tract homes. Right: Close up of window frame details. Santa Fe Casing MM 230 was used on this job. Click HERE to see Santa Fe Casing MM 230 in our catalog. 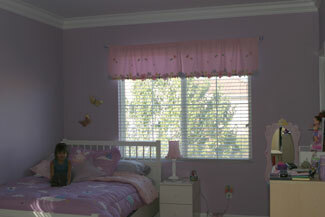 A young princess lives in this home, and she proudly posed in her fantasy bedroom with lavender walls and the satin white moulding. 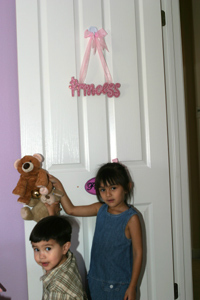 Her equally proud younger brother showed off his room with maize and bachelor button blue and the same fresh white crowns and window frames.